Bicyclists in California have every right to venture out onto the roads without fear of getting hit by a car or other larger, heavier vehicle. If you have been seriously injured or lost a loved one in a bicycle accident, consult a bicycle accident attorney about your options. At the law firm of Corsiglia McMahon & Allard, L.L.P., in San Jose, we help clients seek fair compensation from the drivers who are legally responsible for their bicycle accidents. Contact us online today for a free consultation or call (408) 289-1417. You will not pay anything unless we win your case. We serve clients in Northern California cities such as Santa Cruz, Mountain View, San Jose, Santa Clara, and Campbell. Notable Case Result: $1.2 million for plaintiff in an automobile-bicycle accident where the plaintiff was an orthopedic surgeon. Under the California Vehicle Code, bicyclists have the same rights and responsibilities as all other vehicle operators. Drivers of motor vehicles are legally required to respect the fact that bicycles, even though they may be slower and smaller, have every right to be on the road. If you were hit by an impatient or otherwise negligent driver while riding a bicycle, you may have a right to compensation from that driver’s insurance company. Of course, bicyclists are also expected to observe all the same traffic laws as everyone else. However, violating a traffic regulation does not give someone else the right to hit you. Drivers must make reasonable efforts to avoid bicycle accidents. Even if an illegal action occurred, such as riding on a sidewalk or crossing at a red light, the other driver may still be legally responsible for the accident. Since bicycles offer no protection from outside forces, these accidents often result in catastrophic injuries and even fatalities. The lawyers at our firm are experienced in aggressively pursuing the maximum appropriate damages for injured bicyclists and their families. We retain top-notch experts and meticulously prepare for the possibility of going to court, if necessary, to help you obtain the compensation you deserve. Do not hesitate to contact us to discuss your bicycle accident injuries. 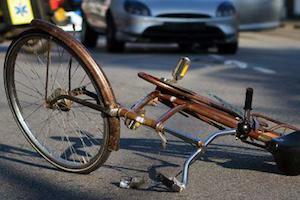 Call our San Jose bicycle accident attorneys at (408) 289-1417.